Jack Black as "Bernie Tiede" in BERNIE. Bernie (Jack Black) is an odd sort of fellow. He’s a mortician who sends off the deceased from small town Texas to Heaven in style. Little old ladies love him; he goes to church, donates his time and money and is liked by everybody. He’s quiet, but sings sweetly, and appears to be happy just being himself. Larger-than-life comedians take note of Black’s subdued, character-enlightening and hilarious performance. Bernie meets wealthy widow Marjorie (Shirley MacLaine) and like with all little old ladies, he wants to make sure that she’s properly cared for during this tough time. The difference is that this time she’s trying to keep distance from his flirtations rather than the other way around. She’s not nice, and the other residents are pretty sure there is only word that suitably describes her. She has one son and four grandkids; some of whom have attempted to sue her, and the others have actually sued her. 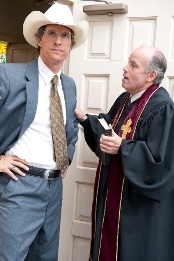 Larry Jack Dotson as "Reverend Woodward" in BERNIE. Bernie and Marjorie have a need for each other; money, companionship, and who knows what else. Their relationship is simultaneously unclear and creepy. This is where the plot develops. Bernie is up to something and the townsfolk are either going to stand by their man or paint him as a criminal (or homosexual, because in Carthage, Texas they’re pretty much one in the same). Bernie’s main adversary is District Attorney Danny Buck (Matthew McConaughey). He’s sure that Bernie is gay and he’s also sure that Bernie is up to no good and will pay for whatever crime he has committed. McConaughey was extremely funny and was able to play into his Texas background but was completely different from anything he has done before. There’s something special about an actor who can follow up the success of “Magic Mike” (2012) with something like this. Linklater has followed this true story to the letter, even using real town residents to introduce us to the character of Bernie. His genius comes through in the writing. The dialogue is unbelievably funny and he uses people’s need to laugh rather than their commitment to empathy to get us to connect to this film. Considering how funny and enjoyable the rest of “Bernie” was, the ending seemed out of place. Upon further reflection, it was exactly the kind of jolt back to reality that was needed. Leaves of Grass (2009) - A violent, comedic, crime drama character study. Me and Orson Welles (2008) - The perfect blend of coming-of-age and theatre. Miss Nobody (2010) - Murder in a fun, cartoon-like environment.